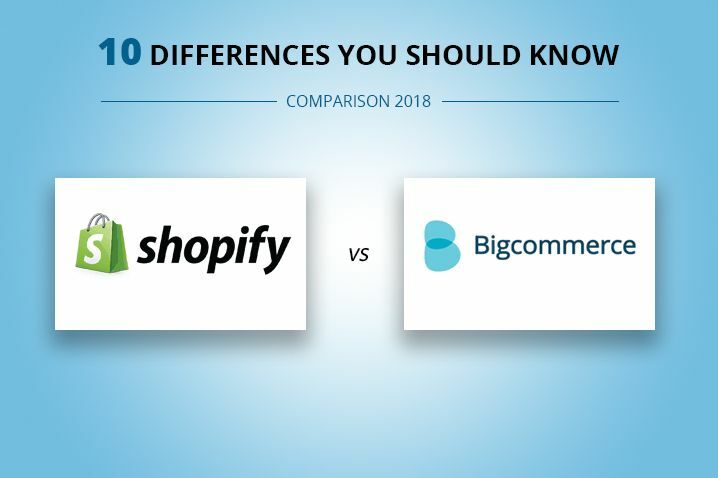 Do you want to know the differences between Shopify and BigCommerce as you are in the process of setting up your shopping cart and selecting the best platform for your online business? Yes, these two are the most popular platforms in the industry today and you have rightly narrowed down on these two options. Moreover, it is important that you pick the most suitable platform for your needs so that you are not forced to switch to a new platform within a short time after the installation. Let us look at the top ten differences between these two shopping carts. Both ecommerce platforms are hosted solutions. As you are setting up a business website price should be a key factor. When we are talking about the price, we are not just talking about the initial setup costs but the ongoing costs. These costs will chip into your profit so you need to make wise choices. BigCommerce does not charge any transaction fee for its Basic membership which allows you to process a maximum of $50,000 per year. There are other plans for higher processing ranges. You can scale up as per your business needs and as your business grows. You are allowed to use any payment processor of your choice. You have greater flexibility with the payment processors as it does not affect the ongoing expenses in any way. The plans start from $29.95 and goes up to $249.95. Shopify on the other hand operates differently. You will need to use Stripe-powered payment processor to avail free transaction facility. If you use other payment processors, you will need to incur the expenses on the transaction fee that does up to 2% per transaction depending on the plan to which you have subscribed. Here there are no processing limits. In both cases, BigCommerce and Shopify you will need to pay credit card processing fee. Shopify’s plans too start at $29.95 but it goes up to $299 for its advanced plan. The next important difference you should be considering is the user-friendliness of the platforms. Whether you are going to handle it yourself or you are going to use hired resource to manage your store, it is important that the backend interface is easy to use without any need for a long learning curve. In this regard BigCommerce will score high because they have just a single dashboard using which you will be able to manage the entire show from inventory to billing. Whereas with Shopify things are a little different and you will need to multiple sections with Shopify. Moreover the terminologies used are not intuitive in Shopify. It needs some getting used to before one could easily take care of the operations. Nothing complicated but still there is a bit of a learning curve here which needs to be addressed. The quality of your ecommerce website design is an essential element in establishing credibility among your customers. You will therefore need to use impressive designs for your shopping cart. Both platforms use themes and templates format. However, the difference comes in terms of the free templates that each platform offers. BigCommerce gives you seven free templates whereas Shopify offers 24 free templates that are good enough to get you started. With paid or premium templates, Shopify has around 149 templates the cost of which starts from $100 and goes up to $180. BigCommerce offers 76 templates and starts from $135 and goes up to $235. So in terms of design options and templates, Shopify scores more both in terms of the number of options and the cost. The number of themes each platform offers will grow with time but the cost factor is what needs to be taken into account. As far as basic tools are concerned, both platforms give you all the basic tools required to set up a basic shopping cart out of the box. However when it comes to advanced tools and features, we need to take a closer look. Here BigCommerce is seemingly more generous. Advanced tools with Shopify come at a price and compared to Shopify BigCommerce brings you more number of advanced tools as part of the package without having to pay any additional fee. Basic features and tools may not be sufficient for everyone. When you grow in leaps and bounds, you are likely to need more advanced functionalities. The ecommerce platforms allow you to add more functionalities to your store through the form of apps. You can find platform specific app stores for both platforms. Shopify has a far advanced selection and range of apps. It has a massive selection of 1400 apps and the numbers continue to grow. BigCommerce has a collection of just 250 apps for its users. It may take quite a while for BigCommerce to close this gap and Shopify certainly stands out in terms of its selection of app. To help customers who are still in a dilemma to decide both platforms give free trial periods. You will be able to use all the features of the shopping cart during the trial period. Shopify offers a maximum free trial period for 14 days. Whereas BigCommerce offers a maximum trial period for 15 days. For those who think it is not possible for them to work with templates, themes and the initial setup process, both platforms offer setup support through experts at an additional cost. Here Shopify is more organized and a better support structure with a large team of experts to support the customers. BigCommerce even though it gives you access to pre-screened talents, they do not have a team that is as large as Shopify’s team. If you have chosen BigCommerce one of the features that you are likely to celebrate about is real-time shipping quotes. This feature is available even with Shopify but you will have access to this feature only if you go for the highest paid plan. On the other hand BigCommerce makes it part of its out of the box feature for its standard plan. If you need to incorporate this feature in your Shopify shopping cart, you will need to cough up a huge sum of money every month. This is certainly a very strong point of BigCommerce and they have strategically included this feature as a part of their standard plan whereas Shopify has it only as a part of their most expensive plan. Different types of business owners setup their online shopping cart to reach their target audience. With regard to the Shopify you will find built-in tools and features that will let you promote or sell your products in other platforms and modes too. Shopify considers online sales as one of the sales channels and not as the only sales channel. Here you could be having even an offline outlet and at the same time go ahead with online sale. Such business owners will prefer Shopify. However if you choose BigCommerce, you will be able to sell only through an online store. BigCommerce focuses only on businesses that solely sell through online stores. This is going to be the ultimate factor that is going to make all the difference to the business owner when it comes to finally deciding which platform to choose if they are not too keen on looking at the specific features and specific capabilities of the ecommerce platforms. The overall credibility is measured based on the total number of paying customers who are using the hosted ecommerce platform. Shopify seems to have a much large client base and a higher number of paid customers with considerably large percentage of transactions when compared to BigCommerce. The popularity of the ecommerce platform can also be assessed based on the number of people who search for the ecommerce platform online. We can access this data from Google Trends as per Google’s data Shopify searches get a higher number of hits when compared to BigCommerce. Shopify has a much higher score here which may not be so easily possible for BigCommerce to reach unless something unexpected happens either one of the platforms for this trend to change. In conclusion, each platform has its own advantages and disadvantages. Each platform has specific strengths and weaknesses. You will need to take your specific business model into account. What seems to be best for another business in your own niche may not be suitable for you. Therefore it is vital that you take adequate time to carefully review the differences before you invest your money in setting up your shopping cart so that you do not end up spending twice in setting up your ecommerce site in one platform and move to another within a short while just because you did not pay attention to details while screening your ecommerce platforms.